We provide acute care for babies, children and youth who are sick or injured and need pediatric emergency care. 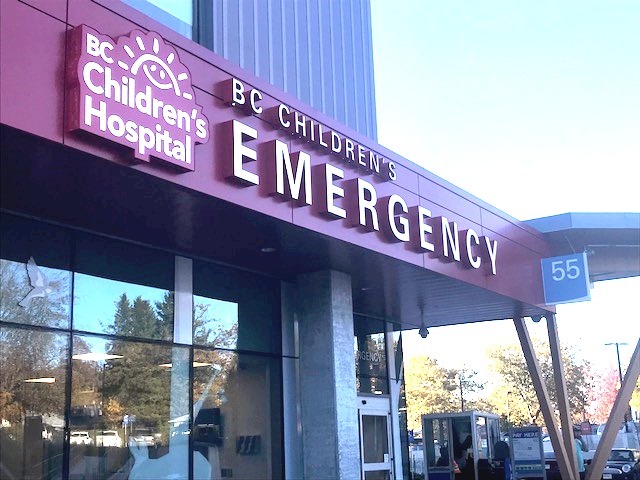 British Columbia Children's Hospital Emergency department is the province's only Level 1 Pediatric Trauma center and provides care to more than 43, 000 patients annually from across the province. We assess and treat pediatric patients up to 16 years of age who present with acute medical, surgical and mental health illnesses or injuries. Sometimes it is difficult to know whether your child has a serious problem. One in three children who come to Emergency could be managed well by a community physician or in a community health centre. Has a high fever, appears very sleepy, and has not improved with acetominophen (Tylenol) or ibupfrofen (Advil). When you arrive at emergency, you will see a triage nurse who will provide an initial assessment that the healthcare team uses to determine which patients are seen first. Children with life-threatening illnesses or injuries are seen first. We appreciate how stressful a visit to the emergency may be for your child/youth and you. We try to see all of our patients as quickly as possible while maintaining high quality care. If you feel that your child’s health situation has changed while you are waiting, please tell a nurse right away. If your child is not seriously ill but you still need medical advice, you can contact some of the resources in your community. Your primary care physician’s office. If your primary care physician is not available, often their office answering service will indicate who is on call for them. Poison Control Centre: 1-800-567-8911 FREE. Family Medical Centre (also see telephone listing for Clinics in the yellow pages) www.yellowpages.ca which can assist with minor emergencies such as stitches & some casting. Hand-washing is the best way to avoid passing on germs. Please wash your hands before and after being in the Emergency Department. There are also Microsan stations with disinfecting hand lotion available on site for your use. To ensure the safety of your children, please keep them with you at all times. ?You do not need a referral to use this service. Emergency is open 24 hours a day, at all times. If you live in Vancouver, go to Emergency at BC Children's Hospital. If you live outside Vancouver, please go to your local hospital's Emergency.